Citizens are political simpletons--that is only a modest exaggeration of a common characterization of voters. Certainly, there is no shortage of evidence of citizens' limited political knowledge, even about matters of the highest importance, along with inconsistencies in their thinking, some glaring by any standard. But this picture of citizens all too often approaches caricature. Paul Sniderman and Benjamin Highton bring together leading political scientists who offer new insights into the political thinking of the public, the causes of party polarization, the motivations for political participation, and the paradoxical relationship between turnout and democratic representation. These studies propel a foundational argument about democracy. Voters can only do as well as the alternatives on offer. These alternatives are constrained by third players, in particular activists, interest groups, and financial contributors. The result: voters often appear to be shortsighted, extreme, and inconsistent because the alternatives they must choose between are shortsighted, extreme, and inconsistent. 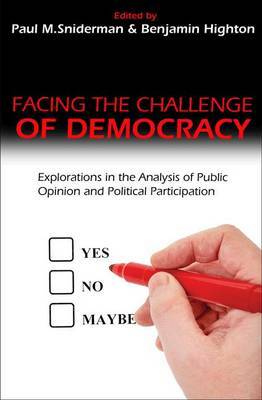 Facing the Challenge of Democracy features contributions by John Aldrich, Stephen Ansolabehere, Edward Carmines, Jack Citrin, Susanna Dilliplane, Christopher Ellis, Michael Ensley, Melanie Freeze, Donald Green, Eitan Hersh, Simon Jackman, Gary Jacobson, Matthew Knee, Jonathan Krasno, Arthur Lupia, David Magleby, Eric McGhee, Diana Mutz, Candice Nelson, Benjamin Page, Kathryn Pearson, Eric Schickler, John Sides, James Stimson, Lynn Vavreck, Michael Wagner, Mark Westlye, and Tao Xie.